As pipe smokers and collectors, we are always looking for our next favorite pipe, or our next favorite tobacco blend. Typically, we don’t have to wait too long until a pipe or blend comes along that piques our interests and gets our heart pumping to get our hands on it and give it a try. Like a golfer that has a perfectly good sand wedge that has served him well for years, something new that looks cool and feels good in your hands comes along, and you grab it up. Most of us do the same thing with pipes, lighters, tobaccos etc. The problem is that more often than not, that sand wedge is no better than the one you had before, and while it certainly does the job, your scores don’t change and the whole proposition ends up being a big let-down that cost you $150.00. Always looking for an innovative design, a new personal take on a traditional shape, a tobacco blend that has just a little more of the stuff I like and a little less of the stuff I don’t, or something completely and totally different—I ran across an item that was more than just a little different, it was radically different as far as pipes go, and in a very cool way. The Morgan Briar Cigar. I first spoke to Chris Morgan on a drive home from my day job. I was just getting ready to dial the phone to call another member of the pipe community when my phone rang. I did not recognize the phone number, but I did have some acquaintances in that area code, so I picked up the call. I will never forget my first conversation with Chris Morgan. I had done a quick review of the Briar Cigar on my blog, more or less just announcing its existence and linking to Chris’s web site. Really it was just a basic reformatted regurgitating all of the information I could pull from his site about this Briar Cigar ‘thingy’, but it was helpful to a great many readers. As I do with most of my blog posts, if I have written about a pipe or pipe crafter, I like to send them a quick note to let them know I highlighted them on the blog, and I had done so with Chris. My contact information in the email contained my phone number, so rather than respond by email, Chris dialed me up. “Tom, this is Chris Morgan.” I was stunned. I was not expecting this call, and knowing how busy most pipe crafters are, I typically do not get a call back. Matter of fact, this was my first in response to a blog introduction. To my pleasant surprise “Thanks for the review on your blog”… was followed by nearly 45 more minutes of Chris’ precious time discussing everything from the Briar Cigar, to the problems with social networking and the politics of pipe and cigar tobaccos. Firstly, I was immediately impressed by Chris’ knowledge and understanding of facts related to the tobacco and pipe making industry. More so however, I was also taken by his willingness to share poignant and revealing opinions with little or no thought given to how I might respond to them. His opinions were important to him– whether I agreed with him or not. Chris’ every thought or opinion was expressed with respect, foundational resources supporting how he came to form those opinions, and all of this to a man he had probably never even heard of until two hours prior. Let me be clear; this is an incredibly easy way to come off as arrogant, spitefully opinionated, or at the very least off-putting. With Chris however, I never got that feeling. I was simply glad to be talking to him, and I found his mannerisms, fortitude and spirit to be uplifting and infectious. It is a rare combination in a man to be grounded in his convictions, yet gracious in their presentation. I appreciate little more than unapologetic enthusiasm. Chris seemed like the ‘Energizer Bunny’ of that. Needless to say that during this conversation, one of the things we agreed upon was a full review of the Briar Cigar, and the opportunity to do a promotion giving away one of his Briar Cigars to a lucky Facebook follower. And so it was on. The Briar Cigars were received just a couple of days later. While I had known that the Briar Cigar was in fact a smoking pipe in the shape of, and that functioned much like a cigar, seeing one up close and in person gives one a whole new appreciation for what Chris has done. While Chris is not the first person to conceptualize and produce a cigar shaped pipe, he has made it right, and done so at a time in history when the market was looking for something innovative. Taking what was formally a novelty, Chris turned it into a platform that will grab some market-share. Of that I’m convinced. When I started to research the concept, I found an interesting newspaper clipping circa 1938. There have been novelty like pipe-shaped cigars for some time. 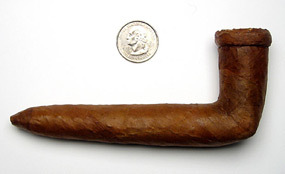 A quick internet web search will find a plethora of designs, shapes, sizes and manufacturers of such pipe-shaped cigars (Pigars), including Highly touted Cuban brands, some of which are still available today. As far back as the early 1900’s cigar pipes were manufactured. The Vauen Zeppelin is probably the most famous of them. It was originally designed as a ‘no-spark’ option to smoking, so that one could enjoy a pipe on hydrogen filled Zeppelin dirigibles. To my surprise, a modified version of this pipe is still apparently made and marketed today. But this is a far cry from the Morgan Briar Cigar. Not a cigar made to look like a pipe, and not having to meet the burdensome safety restrictions of being safe for use onboard highly-explosive hydrogen gas filled transportation balloons, the Morgan Briar Cigar is not only uniquely different, it is uniquely better! The Morgan Briar Cigar is a true pipe manufactured from quality Romeo Briar, cut, carved, rusticated and/or polished just like a traditional briar pipe, only these are made in the shape of a cigar. Let me tell you something, not only has the concept become reality, it is not a novelty any more. The concept has been all but perfected in the Briar Cigar. These are quality pipes made by quality hands that do the job with fantastic results. The design is such that its patented Reverse-Calabash engineering in the airway, make it a wonderful smoking pipe in its own right. All ‘novelty’ is long set aside. I wanted to get into more detail about the Reverse Calabash system, and even thought of taking this sample, and cutting in half length-wise to give you all a better look and understanding. The idea did not last long as there was no way I was going to cut my Briar Cigar! Therefore, setting that blasphemous thought aside, I did the next best thing. I emailed Chris to see if he has a sample cut-away that I could borrow or if he had pictures of a cut-away already—or for that matter, even just a drawing. Almost immediately, my phone rang and it was Chris calling me back. Funny thing: as fate might have it, people like the Briar Cigar so much that they are already trying to copy it and infringe on this Patent Pending design. Per Chris’ request I will not be showing the inside of the pipe in an effort to help him maintain his exclusivity on the design. Suffice it to say that I have no plans to reveal it, and that based on my testing the Cigar, is worth protecting. 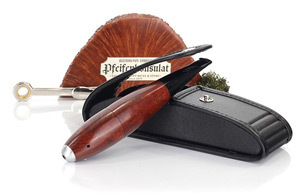 The Morgan Briar Cigar comes in three main parts, the cigar body itself, the mouthpiece and the Ash-cap. My sample came rusticated, with the look and feel of a real hand-rolled cigar. 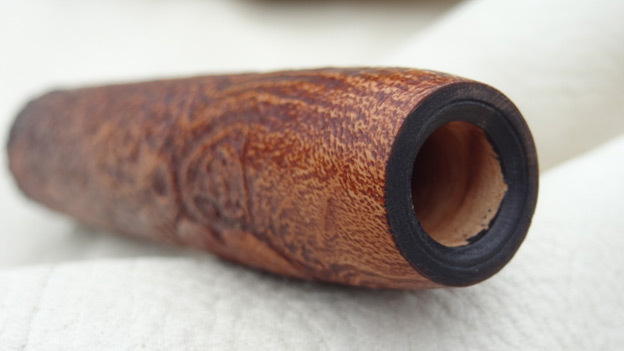 The ash-cap (my term, not Chris’), is also made of briar and is cut and hand-rusticated in such a manner as to mimic the look of burnt ash on the end of the cigar. But, this device serves a greater purpose as well. 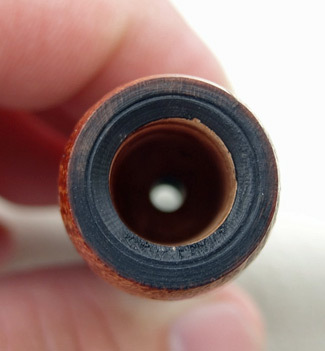 The ash-cap comes with a rubber O-ring installed that helps the cap stay captured on the pipe, and prevent full length airflow through the cigar when the pipe is loaded. This allows the owner to keep the tobacco stored in the chamber moist as possible over an extended period of time. More on that convenient option later. While my sample did not exhibit the latest feature, all Briar Cigars now come with an improved tobacco chamber end that is threaded. The threads contact with the O-ring, which allows the ash cap to thread on to the body of the pipe making ever more secure and air tight. 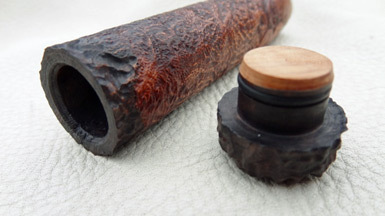 Dimensionally, all the Briar Cigar bodies are made to the same basic size. They measure out to be 125 x 22mm, or for you cigar aficionados (sorry, I’m not), a 52 ring-gauge cigar. The tobacco chambers are coated with a proprietary bowl coating to protect the bowl as you see in a lot of traditional briar pipes. The coating enhances the production of cake that in turn protects the briar from extreme heat adding to the protection and durability of the pipe. 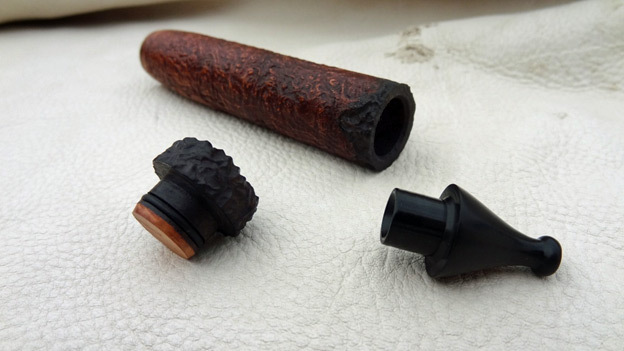 The bits on the early production Briar Cigars are made of high quality Ebonite, as is common with most modern pipes. Current production models (again, more on that later), are now made of a proprietary soft acrylic which provides greater comfort for the smoker, and a smoother, more longer lasting finish than ebonite. But for the most part, what commonality existed between the Briar Cigar and the traditional smoking pipe with regards to the mouthpiece ends there, as the mouthpiece on the Briar Cigar is part of that “patented arsenal of internal mechanics”. Enjoying the delights of the Briar Cigar is easy. 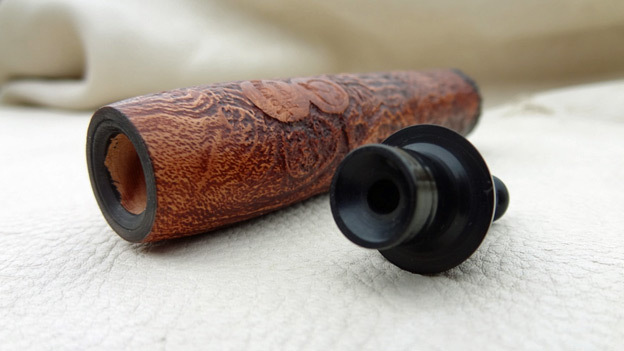 Only one possible detail sets smoking the Briar Cigar apart from smoking any other pipe. You will need a tamper small enough to fit in the tobacco chamber. For most of us this is an easy thing to accomplish as a tamper is in the arsenal of most pipe smokers. However, it has to be small enough for the job, which is not even a consideration when smoking a traditional pipe. For me, this was an excellent opportunity to put to use a new tamper I had just received from Gabriele de Fiume. This tamper is made of olive wood, and as with all G-Tampers is designed specifically to pack the pipe so that the un-burnt tobaccos that may be hanging on to the edges of your bowl will be redirected into the center for a more even and complete burn. For a better look at the G-Tamper, you can click HERE. The G-Tamper worked excellently, and I was soon filling the Morgan Briar Cigar with what seemed like the perfect tobacco for this occasion, Gawith & Hoggarth’s Rum Flake. As recommended by Morgan pipes, the Briar Cigar works best with fine cut tobaccos. 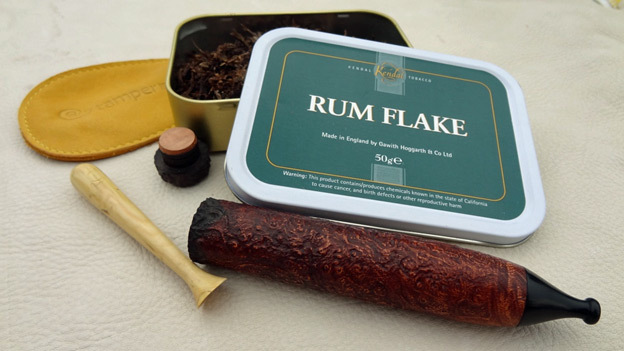 While the Run Flake was not super fine, it is a narrow-cut flake that went into the tobacco chamber easily with the tamper, and packed nicely. Now what you do with the Briar Cigar from this point is totally up to you. Light it and enjoy it immediately, or (I told you I’d get back to this…) put the ash-cap on the cigar, stuff it in your shirt pocket, and save it for a later time. Not only that, but if you are taking a break at work and get the opportunity to fire-up your Briar Cigar and get interrupted, no problem. Tap out the loose ash, reinstall the ash cap, and go back to work. No muss, no fuss, and the Cigar is ready for a re-light whenever you are! I chose to light mine right away! The cigar lit with ease, and immediately, the smoke was as enjoyable as any traditional pipe I had smoked, and I knew right away this was going to be easy. This was a pipe that I’d enjoy using. The draw was smooth and powerful through the Briar Cigar, but came out cool and flavorful with no perceptible bite. This is a testament to the engineering and the patented chambers and airflow system that Chris developed for this pipe. I can only presume that the expansion chamber between the tobacco chamber and the mouthpiece really cooled the smoke efficiently. Regardless, whatever Chris has done, it is shear genius, and I love it! The pipe never got hot, only warm in the hand, and the idea of capping it off and putting in your pocket is not only viable, but to me, quite desirable. I did exactly that. For the purposes of testing the theory, I smoked this pipe for about 8 minutes, what I presumed to be about half way, tapped out the Rum Flake ashes and capped it off still smoking. It was warm as you’d anticipate, but not hot, and slipped it into a pants pocket. No problem—Rum Flake, I’ll meet up with you later! Over-all, I do not think this experience could have been any better. Meeting Chris, having his help and supporting him in a promotional giveaway, and getting to test his Briar Cigar were all excellent experiences. The Briar Cigar that Chris Morgan produces is as innovative a product that the pipe industry has seen come along in many years and truly shows the man’s drive and intellect. It is one of those products that brings a whole new segment of interest to the pipe smoking community while at the same time infusing a greater enthusiasm into those who already consider themselves part of Tobacco Pipe consumerism. The Morgan Briar Cigar has grown in popularity to the point where Morgan pipes can no longer handle the volume of sales it was generating. Because of that Chris had to make some tough decisions regarding the growth of his company. To meet demand, Chris was either going to have to significantly raise his prices to slow demand (very often a business killer), or find another way to meet demand. Enter Italy. Chris has worked out a deal with a well-known Italian pipe manufacturer that has a long and stellar history to produce his Briar Cigars to his exacting standards. The Briar Cigars are still hand-made, but made in volume by some of the world’s best pipe craftsmen. I want to be clear that this does not mean they are being cranked out like toy blocks, mass-produced without regard to quality. That is clearly not the case. These units are still hand cut, hand-turned and well made – just in greater volume than one custom artisan pipe manufacturer can do in his shop with limits set by time, space tooling, and machinery. Additionally, there was no way Chris could handle the demand on distribution. For this reason, Briar Cigars are now being sold by a number of different commercial pipe resellers on the web, and internationally. My recommendation—get one today.